This was another bread-making experiment, and I have to say I was very pleased with the results! I was asked to make the communion bread for my church, and after a bit of searching I found a recipe that was exactly what I was looking for. I needed a bread that was easy, soft enough that it’s easy to pull off a piece while passing the bread in church, and has a nice texture that won’t cause a mess of crumbs everywhere. My dad said this was the best communion bread he’s ever had…which probably has to do with the fact that this is based off a French bread recipe, and there’s no bread like French bread in my dad’s opinion. The bread came out looking a little funny…the bottom stuck the the pan and then it puffed up so it has a bit of a mushroom shape, but (think of it as a one-up mushroom from Mario, says Dad) it had a great taste and texture. I’d definitely make it again! While I made this in a stand mixer, if you’re up for an arm workout I think you could make this by hand as well, just knead the dough instead of turning on the mixer. In the bowl of a stand mixer, dissolve sugar and yeast in warm water. Let sit for about 5 minutes, until bubbly. Add salt, oil and half the flour. Using the dough hook, mix the dough until it comes together, then add the remaining flour. Mix until dough forms (should pull away from the bowl easily). Remove dough from the hook and let sit for 10 minutes, then turn mixer on for a minute. Repeat for a total of 5 times. After the last time, turn dough out onto a lightly floured surface and shape into a ball. Place on a baking sheet lined with parchment paper. Using a sharp knife cut a slash in the top of the dough, and cover with a clean dish towel. Let rise for 30 minutes. Preheat oven to 375°F. 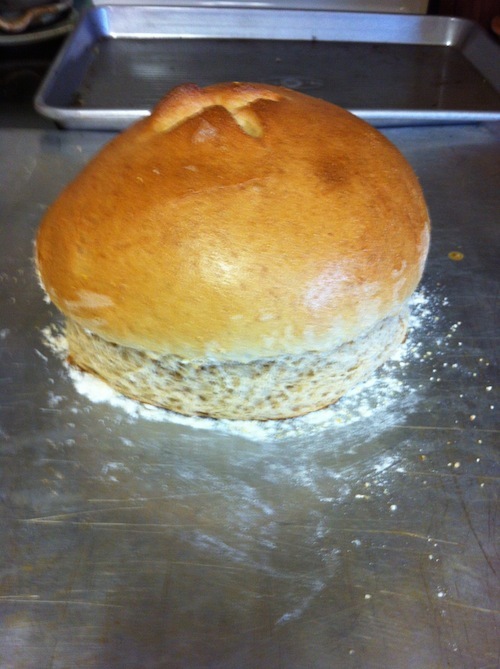 Brush boule with egg wash (egg mixed with a little water), then bake for 25-30 minutes, until golden brown. I’m so glad you had such good luck with this! Yeah it was great! Wish I’d kept the original proportions so I had two loaves! Thanks for the great recipe and for visiting!